Email Marketing Connect2010 Conference: Speakers include Argos, BBC, Econsultancy and NMA plus more! 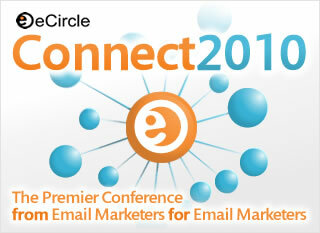 On Thursday 15th April eCircle will be hosting its Email Marketing Connect2010 Conference at the luxurious venue The Soho Hotel. This great value full-day event is a great opportunity to hear speakers from top UK brands such as Argos and the BBC as well as network with fellow marketers! Since 2005 over 800 top online marketing executives have attended 8 eCircle Email Marketing Conferences to hear speakers from some of the UK’s leading brands share their knowledge and experience, making eCircle’s Connect Conference the only place to be for email and online marketing professionals. As a special thank you to our loyal blog readers we are currently offering a special 25% off ticket prices for the first 10 people that book using the discount code: ‘ecircleblog’ (normal ticket price just £250 inc VAT), so get in quick and sign up now to take advantage of this fantastic offer! Once registered you will be added to the list and if successful our marketing team will be in touch to confirm your place personally. Please note this event isn’t currently open to agencies. FREE email critique: During Connect2010 we will be running an interactive email critique session where our panel of experts and audience members will discuss what’s hot about email campaigns and what’s not! To have your email critiqued for FREE please forward your emails to l.hudson@ecircle.com. And last but not least if you’re an avid ‘tweeter’ we have set-up the following hashtag on Twitter: #ecconnect2010 to allow you to tweet about Connect2010. We really hope you can join us at this fantastic event and look forward to welcoming you on April 15th.